As the New York-based African Film Festival (NYAFF) kicks off its 18th year, what a fitting occasion to profile its founder and executive director, Sierra Leonean Mahen Bonetti. Founded with the support of her husband and important players on the New York City culture scene, NYAFF has become an institution in itself and is a groundbreaking network for the promotion, exhibition, and distribution of African cinema in the United States. As the NYAFF motto indicates "it is more than just a festival". 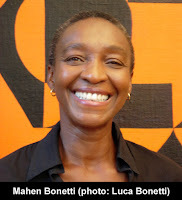 NYAFF as an idea emerged in the 1980s from Mahen's desire to show positive, diverse and realistic visual representation of Africa in the United States, in contrast to the dominant media images of misery and strife. While the festival concept had not yet formulated, she had already begun to look for a way to make a contribution towards correcting these misconceptions about Africa. As the film festival took shape in the 1990s its main objective was to use the medium of cinema to promote awareness about Africa and educate both Americans and Africans living in the United States. At the same time, it has always been committed to the development of an international audience for African films. The scope and scale of NYAFF has expanded during the past twenty years, reflecting the ever-changing realities of Africa and the African Diaspora, as well as new developments in African cinema practices. And while in cinema one often finds a dominance of men, within NYAFF there is a high visibility of women in all spheres. "I think Africa is a woman and everything that is working in Africa is because women are behind it," says Mahen in response to my question regarding the role of African women and cinema. Women have always played an integral role--from the very top of the small organization to the board of directors and advisory board, in the selection of films, and the articles and interviews in the impressive Through African Eyes publication series. The 2011 festival continues to reflect this balance, as women permeate the film listing. In commemoration of the United Nations International Year for People of African Descent, NYAFF celebrates the global contributions of people of African descent with selections by veteran and emerging filmmakers from the continent and the African Diasporas of Europe and the Americas. The festival runs from 6-12 April in New York City and continues throughout April and May with screenings held in various venues in the metropolitan area.